A US federal judge has found a number of leading tobacco firms guilty of conspiring to deceive the public about the dangers of smoking. Firms such as Philip Morris and British American Tobacco were ruled to have violated racketeering laws in a government action launched in 1999. In her ruling, Judge Gladys Kessler said it was clear that "smoking causes disease, suffering, and death". 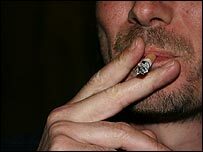 But the firms will not be fined or made to fund anti-smoking programmes. However, they will be required to take action to prevent future fraud. "Despite internal recognition of this fact, defendants have publicly denied, distorted, and minimized the hazards of smoking for decades," the court ruling stated. Those found liable were Philip Morris, RJ Reynolds, Brown & Williamson, British American Tobacco and Lorillard Tobacco. The judgment comes nearly a decade after tobacco firms agreed to pay $246bn to US states to cover the healthcare costs of those struck down by smoking-related illnesses. The companies concerned denied accusations of fraud and conspiracy, originally brought by the Clinton administration. But during the trial, the court was told that the firms had engaged in a "gentleman's agreement" whereby they would not compete to portray each other's brand as more or less harmful to smokers. This, prosecutors claimed, ensured that the firms did not publicly have to address the harm caused by smoking. Anti-tobacco campaigners hailed the outcome as a major victory. "That means from this day forward, the tobacco company defendants are now adjudicated racketeers," said Edward Sweda, a lawyer with the Tobacco Accountability Project at Northeastern University. "This finding undermines the industry's public relations campaign, really since the master settlement agreement in 1998, that they are responsible corporate citizens." But analysts said that the outcome was unlikely to have a major financial impact on the firms' businesses. "There wasn't a lot of financial risk in this decision anyway," said Charles Norton, from investment firm Mutual Advisors. "I don't think the financial penalty will be that big and it will be appealed."